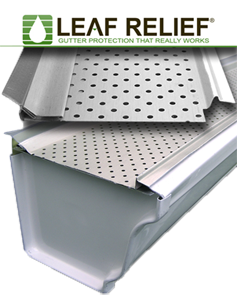 Leaf Relief is the most effective gutter protection system on the market. See how it outperforms the competition! Compare Leaf Relief to other gutter protection products on the market. You'll see why it is the clear choice for your home. Whether you're building a new home, adding on or upgrading your current gutter system, Leaf Relief has a product that will fit your needs perfectly! Leaf Relief brings real relief to homeowners who need a gutter solution that works, first time, every time. Our patented Aluma-Perf TechnologyTM keeps debris out of gutters, allowing water to flow freely. Debris is then lifted off of gutters by a gentle breeze. Leaf Relief mounts securely to the gutter system, resisting damage from high winds, heavy snow, and ice. The tough aluminum construction of Leaf Relief is indelible and resists damage from bugs, squirrels, raccoons, and birds! Leaf Reliefs unique design ends routine gutter cleaning, lowering maintenance costs and hassles! No more dangerous trips up the ladder! Put an end to your gutter cleaning days with Leaf Relief! Don't just take our word for it. Independent testing confirmed Leaf Relief works better than other gutter systems on the market! How? * 29.7 inches of water per hour (20 foot roof section). That's 2.5 times greater than the official rainfall world record (Kilauea, Hawaii- 12 inches in one hour). * 19 inches of water per hour when covered with wet leaves (20-foot roof section). Still 1.5 times greater than the world record. * Most dry debris is cleared from a surface with 6 mph breeze. When still wet, debris is removed with 23 mph wind. * No detrimental or damaging effects at 110 mph wind speed when fastened 16 inches on center.